Ideally located in the most picturesque pedestrian street of the historic center (cobblestones, plane trees and paddle wheels), the apartment is on the 2nd and last floor of an old mansion with shaded courtyard. It is very quiet and the view from the windows is on the trees. It has a living room with two sofas, TV wi-fi DVD player, a kitchen, three bedrooms and a bathroom with Italian shower. The apartment has the charm of old: exposed stone walls, high ceilings, tiled floors and marble fireplaces. You will feel good, with family or friends. Walked ten minutes from Avignon center station. Paul met us on the way over helped with bags up the stairs. Apartment was quiet due to location in a courtyard, even though a main party street was right outside the courtyard. Free parking ten minutes walk at des italiens. Local buses a block away the popes palace about ten minutes walk, number of grocery stores like carrefore city and spar nearby. Easy checkout. Paul is native speaker English and Claudie is fluent in English. We just departed after spending 5 days exploring Avignon and surrounding area. 2 adults and 3 young children (ages 5-9) were easily accommodated in this beautifully renovated apartment. Lots of character from the original old building - interesting architectural details, high ceilings, exposed stone walls, nicely refurbished wooden trim and doors, etc. The spacious apartment is centrally located within the old city so easy access and walking distance to sights, restaurants, bars, shopping. We ate out but also shopped at the local markets and prepared our own meals. The apartment had everything necessary for cooking and the washing machine was a must when traveling with young children. We had a rental car so driving into/around the old city was a challenge. Pay parking was available nearby, or free overnight parking (until 9am) in the lane immediately behind the apartment, but space was limited. Overall an excellent lodging option and good value for a 3 bedroom apartment. Just a few quirks which simply added to the fun and experience of traveling abroad: driving and parking in the old city is challenging and really only practical with a smaller vehicle; the apartment is a 3rd floor walk-up so keep that in mind if you have lots of baggage or mobility issues; expect late night (live music, bar crowds) and early morning (city workers) noises typical of any bustling city; some of the windows had no blinds which can make for some interesting interactions with the next-door neighbours if you're not careful getting out of the shower! There is also free parking just outside the old walls "Parking des Italiens" with free bus back to town (every 5 mins, 5 mins ride). climb low steps. We are always on hand to carry up bags on your arrival and back down when you depart. "LA FETE DE LA MUSIQUE", a celebration held all over France on the 21st of June every year. It's a wonderful occasion and stages are set up all over Avignon with music of all styles. People come from all the neighbouring villages for the unique ambiance that this night has to offer. Other than this once a year event, the apartment is extremely calm. Paul and Claudie could not have been more helpful in their advice on places to visit and places to eat. We loved out stay in Avignon and found the situation of the apartment perfect for exploring the historic centre of the city. There was a choice of good restaurants and cafes in the area. Les Halles, a short walk from the apartment, is one of the best markets I have shopped in - wonderful fresh produce. Thank you again for helping to make our stay such a pleasure. An apartment with comfort and charm, and all the pieces in place. We marveled at how fortunate we were to latch onto this perfectly equipped, clean, delightful space, with not a detail overlooked. Loved the centuries-old stone walls, large windows, and understated elegance of it, and the street below that invites you out to stroll. Paul was great -- warm, welcoming, energetic, and well-prepared. He gave us a map marked up with key sites, and a printed memo with his contact info and other key information. 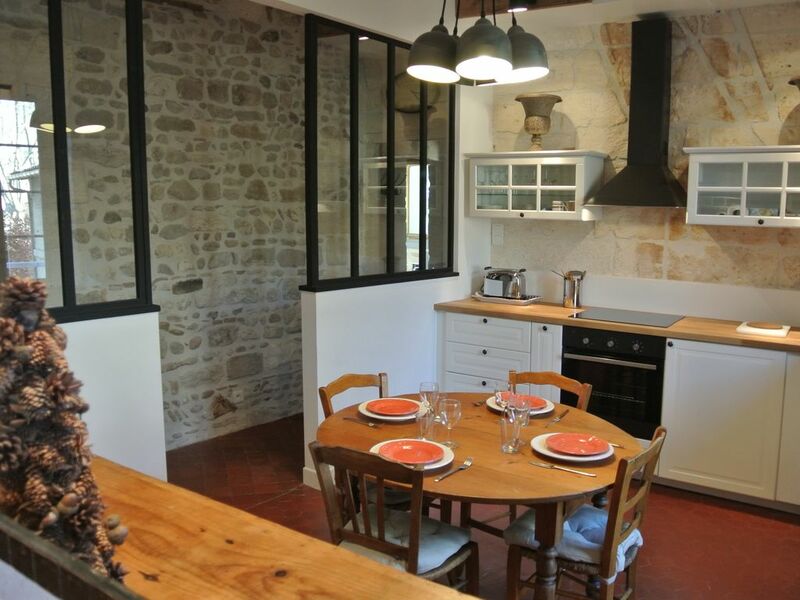 Very convenient to the rich offerings of the indoor market Les Halles, and an easy walk to the center of Avignon's attractions and shops. Great opportunities for eating out, even nearby. Les Tenturiers, down the street, had wonderful food, but we had a waiter that was pretty inattentive and nasty -- be alert if you go. Very good location: only 10 minutes walk to the indoor market, two supermarkets, the baker's and a well-stocked health food store. About the same distance to the bus station and 15 minutes to the train station, which we used all the time. Even in March, the apartment was light for an old building and the rooms surprisingly spacious. A lovely shower and reasonably well equipped kitchen. The only drawback for us was light coming in through the bedroom shutters, since we are used to sleeping in absolute darkness, but that's what sleep masks are for! If, like us, you plan to rely on public transport, do check in the very helpful Tourist Office on the main street first. We tried to get to Villeneuve without asking first but the bus route has been changed while the tramworks are being undertaken so we ended up taking a taxi. Not expensive but we felt a bit stupid. We too were met by Paul as we rolled our cases along to the flat and he gave us all the information we needed and more. Highly recommended. Take Highway exit Avignon north, follow signs to Avignon center by staying near the Rhone, arrived at the ramparts turn left to enter the intramural by Limbert door. The City of the Popes is a cultural city with a rich heritage, the city center is easily visited on foot from the historic sites, art museums and the many small restaurants and cafés. Avignon is also the ideal base for exploring Provence. We are at your disposal to help you enjoy your stay.